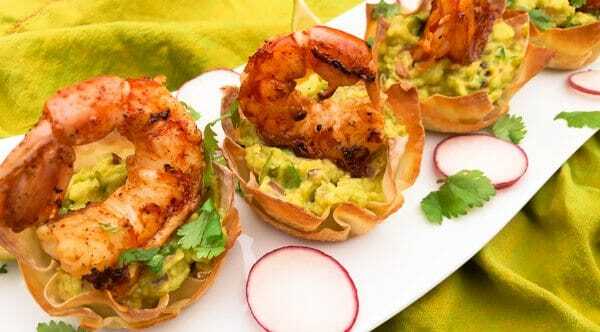 Grilled Shrimp Wonton Baskets | Mexican Appetizers and More! These Grilled Shrimp Wonton Baskets are easy to make, quick and delicious. 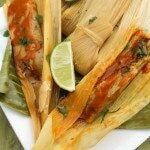 Elegant little Mexican appetizer to be enjoyed anytime! Isn’t it really nice when you can just put together a simple but yet hyper delicious appetizer on the whim? That’s what I strive for with you my foodie friends. I want to bring you these Mexican appetizers that stick out in your mind. I want you to look forward to making that one particular appetizer this weekend, the one that even if you are the type of person to just skip the appetizer and go straight to the meal, you can’t help but want to make it anyway! You say to yourself, I have to try this Mexican appetizer this weekend! It just looks too inviting, that’s got to be delicious! 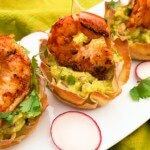 These Grilled Shrimp Wonton Baskets will make you think like that! 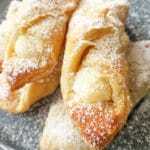 They are the perfect little gem of deliciousness! 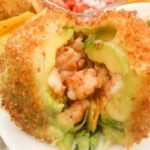 The crustiness of the wonton wrap, the creaminess of the guacamole, topped by the most perfect moist and juicy grilled shrimp! These will make your mouth water even before placing it in your mouth…yes I’m that confident! So this is my story…. 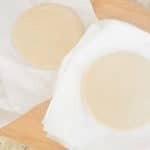 A few days ago, I had a bought some wonton wrappers to make some Asian dumplings, when I found myself two nights ago thinking about an appetizer to make for dinner. I wanted something quick, fast and delicious. Yesss, then I remembered I had wonton wraps, avocado and shrimps! Walla! I was quite happy to realize that this would be a simple but yet yummy appetizer, so I went with it! Not that this was the first time I’ve ever made them but certainly it had been a while and I couldn’t be more pleased! 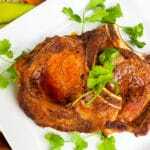 It was quick, easy and scrumptiously delicious! These Grilled Shrimp Wonton Baskets are also fancy or casual enough to have at your next family gathering, perfectly easy for the Super Bowl and yet fancy enough to offer at a wedding cocktail hour! Your family and friends will fall in love with these gems…. Give these a try and let me know what you think. You may also enjoy these Mini Chipotle Lime Shrimp Kabobs. For an Asian wonton version, you may like these Asian Shrimp Wonton Cups by Foxes Love Lemons. Place in a bowl and season with chipotle chili pepper, chili powder, salt, pepper and add olive oil. Mix well together. Refrigerate for 15 minutes. Preheat oven to 350 F. Lightly spray a 24 muffin tin (regular size pan for muffins) with non stick spray. Put a wonton wrapper into each of the 24 muffin tin, then add a second one (this helps to make the wonton cups stronger). Cut avocado in half and remove pit by slapping a knife down on it and twist pit out. Scoop avocado pulp with a spoon and place in a bowl. Mash down with a fork and add the onion, tomato, garlic, cilantro and jalapeño. Season with salt and pepper to taste. Add juice of half a lemon to prevent avocado browning. Using a cast iron or grill pan, cook shrimp over medium heat for 2 -3 minutes on each side. Set aside. 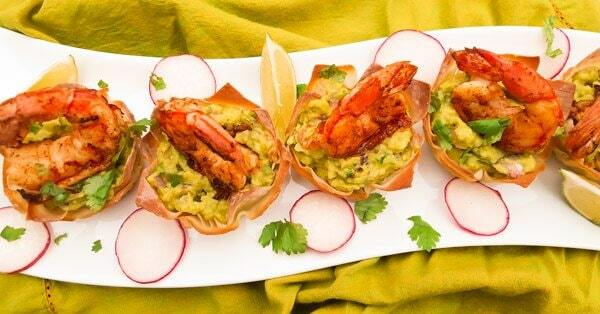 Place a spoonful of guacamole into each wrapper and top with a shrimp. Serve and enjoy! Hi, I like the looks of your recipe for grilled wonton baskets. I need to clarify whether it is a regular 24 muffin pan or a mini 24 muffin pan. I ordered the regular, but now I think the baskets will be too large. Since you only indicate 1 avacodo, I must have ordered the wroing thing. I may need to return the item, so will be awaiting your reply. Hey Pat! Yes you ordered the correct size, a 24 muffin size pan is what I used for this recipe. You ordered the correct size. Yay! Also, when I made this recipe I used the larger Caribbean avocado, all I needed was 1 avocado. So be aware that if you are using Haas avocados, you will need at least two and possibly even 3 if the avocados are smaller than usual. Thank you for bringing this to my attention, I will adjust both in my recipe. Happy New Year Pat…let me know how much you enjoyed these!